Care Packages for Soldiers: Happy Thanksgiving! Thanksgiving is when we gather together with family and friends and to be thankful for all we have. One thing we have is freedom and that is due in part to our men and women serving overseas - thank you for your service. In addition, we would like to thank all of the people and corporations that have volunteered their time and donated funds to the Airborne Angel Cadets of Texas so that we can continue to send care packages to our troops. Please take a moment today to think about our Soldiers, Sailors, Airmen and Marines who are away from family and friends on this holiday. Their service and sacrifice over the years have kept our country safe so we can celebrate Thanksgiving without fear. U.S. 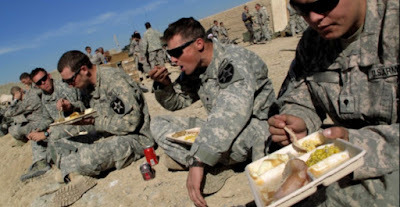 Troops celebrating Thanksgiving dinner. The Airborne Angel Cadets of Texas are honored to support our troops overseas.